We are excited to announce the recently renovated Painted Cliff #9's with all new furnishings! Nestle in after a day on the mountain in this cozy, ski-in / ski-out mountain side get away. 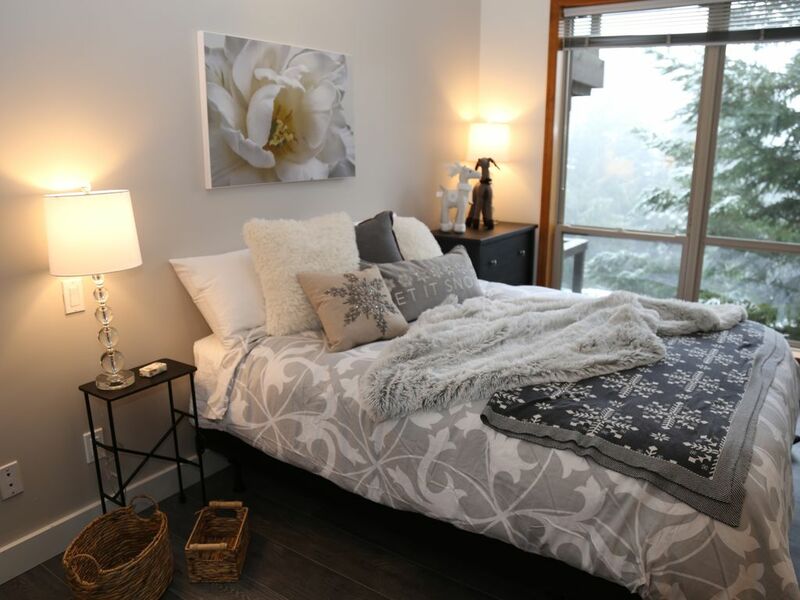 This one bedroom townhome offers convenient access to the Blackcomb Mountain New Gondola. It is just steps from front door to Merlins Run (just walk to end of Painted Cliff complex). The spacious one-level, high-ceiling unit sleeps 4 very comfortably. The Master bedroom has one queen bed. The living space offers a foam-mattress queen sleeper. The living area has an open floor plan with a large picture window showcasing lovely views towards the valley. Additional niceties include a stone fireplace, complimentary high-speed wireless internet, an outdoor BBQ, a large deck, high-end stainless appliances, a fully equipped kitchen, heated bathroom and kitchen floors, secured designated underground parking spot, additional underground guest parking is available, bike storage room, ample closet space and the added convenience of an in-suite laundry room. Guests can enjoy a community hot tub located only short walk from the unit. The unit entry of #9 Painted Cliff has a small area for ski and snowboard storage. Bikes and sleds can be stored in the designated area in the underground parking garage. Access to Whistler Village is a short ride down the mountain by free shuttle bus. The bus stop is very conveniently located across the street from the Painted Cliff complex. Bike storage room in garage for mountain bikes. Road bikes can be kept on deck/porch. Loved the location and the quality of the flat. Well renovated flat with all the amenities one xan wish for. Easy ski in ski out for Bkackcomb moutain. Slightly on the small side for a family of 4 with teenagers but we made it work. Will definitely come back. We loved staying at painted cliff, very easy access to slopes, clean accommodations, hot tub, etc. Owner was very cooperative with a change in plans at the last minute. Would stay again. This place is like a 5-star hotel room. Nicely appointed, and everything in it is top of the line. For coffee freaks like me there was a coffee machine, italian stove top espresso maker, and a french press. Kitchen and bathroom floors are heated. Everything works great. Even the foldout bed is amazingly comfortable. Parking is in a garage right under the unit. The slopes are about a 100 meter walk. I would love to own this place! The owners are super responsive over email and very helpful. 1) The check-in issue... check in is a few miles away in the village. It's right off the highway, so, for most people it's on the way. Here's the issue, if there's no parking in front of the hotel where you check in, and you need to go find parking, and then there is a line at the hotel desk, the process could take 30 minutes or longer. If there is parking and no line, then it might take five minutes. 2) Check out: You have to go back to the same place to check out. And same deal. It could take 2 mins or much longer depending on what you run into. It would be much nicer to just give guests the key code for the door, so they don't have to do the check in/check out thing. * The bed in the bedroom has sharp corners and I banged my ankles twice on it, cut and bruised them. Could use some foam on those corners. * The garage door opener did not work. * Lastly, and maybe this one is on me, but when looking at the description of the place I must have only looked at sleeps 4 and seen "1 bedroom" or the square footage. Instead I looked at the images to decide how big the place was, and from the images it looked like there were two bedrooms and a living room. Additionally one of the images is shoot from above which makes it appear to seem like there is an upstairs or staircase. There is not, the unit is a small one bedroom. But it can sleep 4 people. Lastly, I should mention there are extra fees on this place tax + cleaning fee. Thank you for your thoughtful feedback. We know it would be more convenient to just have a door code, but since we are not local we want to make sure there is a manager who can assist with things like the garage door opener not working. In addition, this is how we collect and return the damage deposit. We will provide your feedback on the checkin/out process to the property manager. We are replacing the coffee filters this weekend! We have tried to be very careful to make sure the photos accurately depict the unit and also are very explicit in our description of the size and sleeping accommodations. We are sorry if you felt this was not clear. We do charge taxes as required by the local, provincial and national government as well as a cleaning fee which is spelled out in the quote before booking as well as in the rental agreement. If you were charged something that was not in your quote or rental agreement, please let me know so we can refund the overage. Thanks for staying with us and we hope you enjoyed your time in Whistler. We very much enjoyed our time at this property! Pictures of the inside are as shown. Our favorite part was the well stocked kitchen. We enjoy cooking and had everything we needed for simple to more complex dishes and an oven that cooked to temp. It took us a little bit to figure out the shuttle schedule but that was very convenient to get into the lower village. The walk down the slope was a bit longer and steeper than we anticipated having stayed at other slope side properties. A few tips...the hottub is extremely small so if you’re coming off the slopes at the end of the day highly probable it will be PACKED. We did not end up using it for this reason but could be nice if you plan for off times. It is ski in ski out but you are walking the length of the complex with your gear which can be slick be careful! Check in is NOT on property but at the Blackholm Lodge in the lower village. If you want a fire bring your own duraflame logs...it’s not gas. Overall the property was great to come back to at the end of the day and relax with gorgeous alpine views and plenty of cozy blankets! Finally as many others have mentioned the bed is very comfortable in the master so we slept great every night and that was fantastic after long days of skiing!